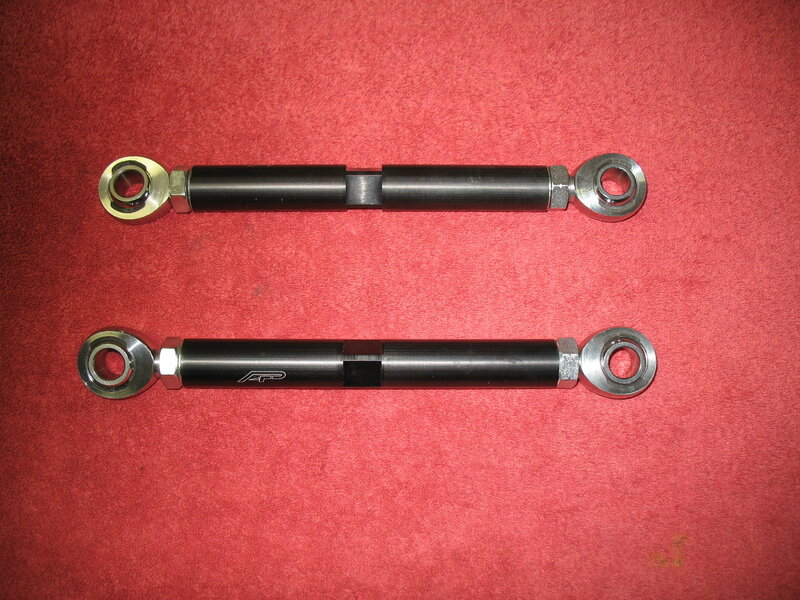 Do you know the bolt length/size the came with the AP sway bar end links? I measured 0.462'' +/- (so prob. 1/2'') on the threads for the factory sway bar end links. Was thinking of keeping the rod ends as is and ordering different hi misalignment spacers (x16) to fit 1/2'' bolts on all 4 end links. this should give the end links a nice snug fit when fitting to sway bar and shocks! 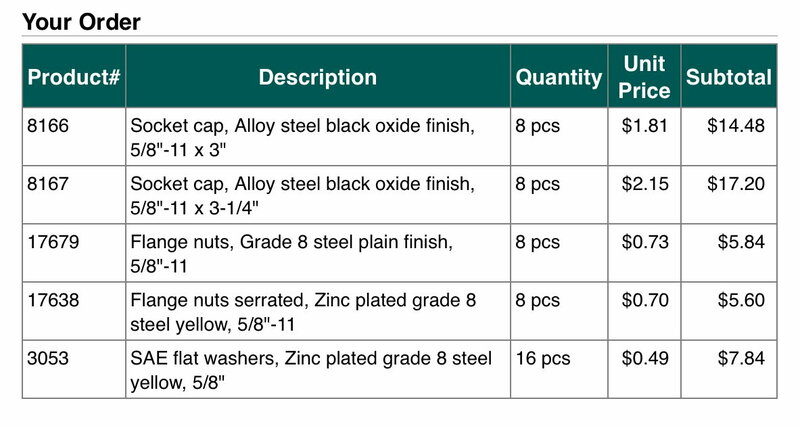 For what it's worth, I ordered the following from BoltDepot.com (I didn't know the exact length, so I doubled up on the bolts). The swaybar and strut holes might have to be enlarged just a bit but I'm ok with that. Also get what you're saying on the spacer JD. I admit I just kinda eyeballed everything because I'm dumb. 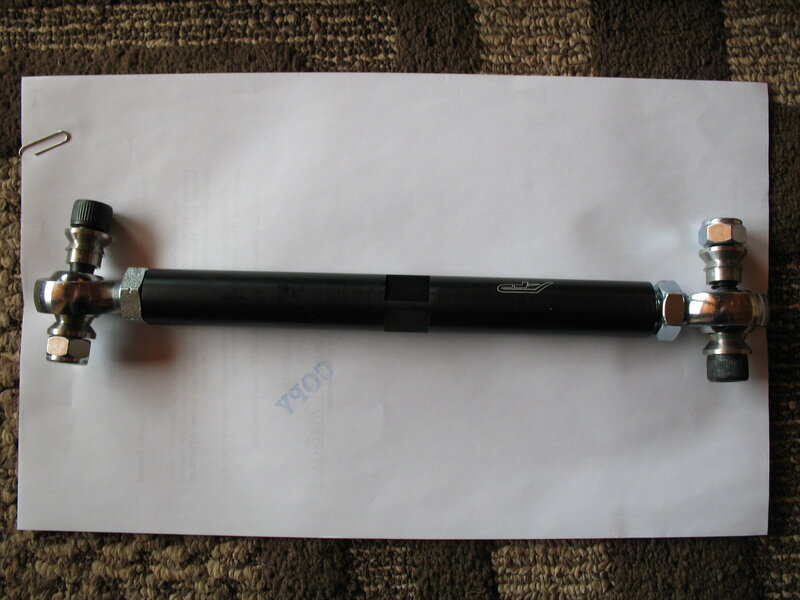 Even the 7" rods I'm not so sure about, so I have an extra set of the 8" ones (I don't want to be stuck with my car on jackstands because I was stupid and ordered the wrong length of anything). I looked at the narrow width of the high misalignment spacers I have, and with the correct bolt sizes (5/8") it shouldn't be a problem as the ID will be tight throughout, end to end The last thing you want is for the bolt to be smaller width than the rod end hole. Even with the correct size spacers, you run the risk of the whole thing getting misaligned I think. I'm not an expert on this though, so if QA1 thinks it's ok then it should be. Last edited by BLKROKT; 03-24-2017 at 08:45 PM. Funny, we're doing the same thing. My Clubsports and KMacs both shipped to me today. I guess I misunderstood the purpose of the high misalignment spacers (from now on 'HMS' so I don't have to keep typing it out) in this application then. I thought, by looking at different end link configurations, that the longer tapered HMS was used on the bar/strut side of the rod end to properly space it away for clearance purposes as the regular spacers didn't seem to be long enough to give you the right angle to prevent binding. But, like I said, I know very little about this from a practical standpoint, I'm just reading a lot and copying how I see them built (and they all seem to have a 'normal' spacer on the bolt side, with a HMS on the other, and a flanged nut to hold it all together). Lol that's funny just got my tracking number for my K-mac kit today. Golan is gonna hold on to the club sports for me and ship em when I'm back home from work. I'm in the same boat man. I'm definitely not the sharpest tool in the shed. At first I thought the same as you about the HMS but when I contacted the tech. Reps at Jegs and QA1 they both said about the same thing about them sliding in to the taper. You Can buy different lengths HMS to account for proper spacing. But if you wanted to keep the same ID as the rod end, then their normal spacers (ss) would do the trick. I don't think I should rely on their advise 100% but I think is a good starting point until I actually start playing around with the car on the lift and see for my self what works the best. As far as binding goes...with 13-14 degrees of forgiveness, the rod end should allow enough clearance when turning to lock on either side. Once installed, I'll just have to check for scoring after working it side to side a few times. Don't quote me but I think by properly adding the HMS it would in fact slightly increase the angle. Here's a quick pic for reference. Last edited by jd_hinks; 03-25-2017 at 12:25 AM. I get it now, thanks for the pics. Time to order new spacers and bolts. Sigh. Here is a pic of the AP link for reference. It has a HMS on either side of the rod end. Thanks Mort, that's awesome. Big help. 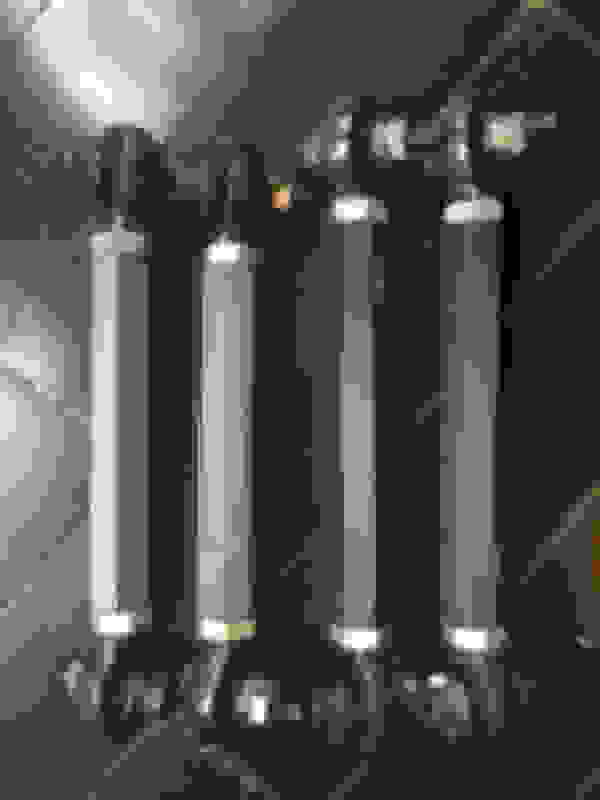 Do you happen to know the length of the socket bolts, and if they're 1/2"? BLKROKT the bolts are 2 3/8" shaft length and 0.467" diameter on the shoulder per my calipers. That is 15/32" diameter and I think it might actually be a M12 1.75 metric bolt. The HMS do seem to be exactly 0.500" ID so there is about 0.30" clearance between the bolts and HMS. On the AP HMS a 1/2" bolt will be a snug fit as I tried a 1/2" bolt. 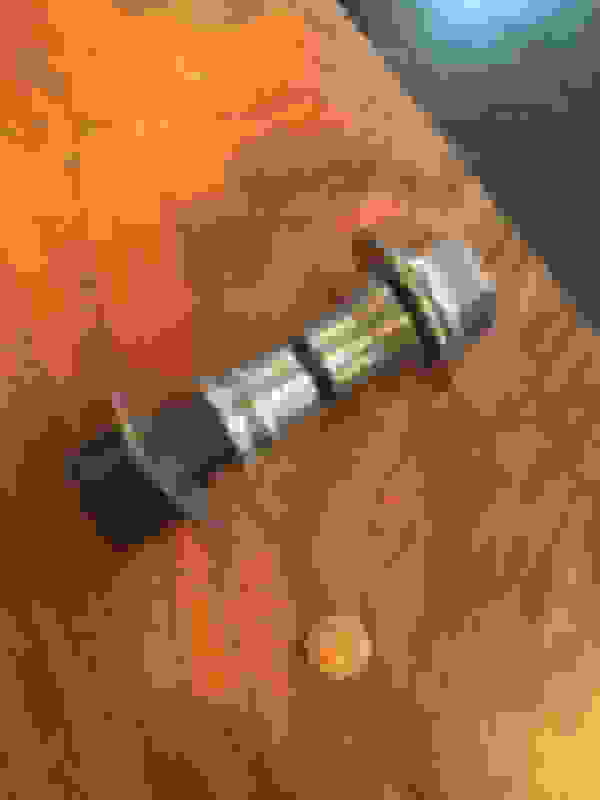 On the outer end of the HMS there is a bit of a ridge that you might have to relieve with a file or drill bit, if your HMS are similar, so the bolt will slide through without forcing it. Check that the bolts will fit through the sway bar ends and strut as well as a 1/2" bolt is too big to fit the sway bar or KWV3 on my car. Last edited by Mort; 03-25-2017 at 12:41 PM. Excellent Mort thanks. So something like this 1/2"-13 x 2.5" socket cap bolt should work perfectly (no need to enlarge existing bolt holes), as long as I get the right HMS. Looking at the correct HMS spacer now. You and JD have been a big help figuring this out, thanks again. EDIT: I wonder if the bolt is smaller diameter than the rod end to more easily allow rotation? I'm not 100% sure that the bearing in the rod ends rotate in that direction (although I assume so since you're bolting it through to keep it firmly secured)? Last edited by BLKROKT; 03-25-2017 at 12:47 PM. I have a feeling the bolts are a slightly smaller diameter to fit the car while the rod ends and HMS are stock USA sizes for cost and ease of sourcing them. Once the bolts are tightened the bearing will be pinned in place and the rod end will rotate around it in both axis. ^ Hence the "clunking" sound that many get after installing these? Maybe? You could well be right on the clunking. That or the bearing wearing the rod end and the clunking coming from there. Time will tell. At least you are removing one potential source of clunking. Lots of packages delivered this week - KW Clubsports and full KMAC bushings. Also the right sized end link bolts and QA1 high misalignment spacers came in. Thanks for the hollow 7" rod JD, just got it today. You can really see the difference versus the non-adjustable units that came with the KWs for the front swaybar. The only questionable thing now, is that on its shortest setting, the DIY 7" end link is the exact length of the unit KW sent for the front. This means that I should probably have used 1" shorter rod in front at least. I won't know until I try to fit, but I'm thinking that 6" front and 7" back is about right for the Joes aluminum rod length. I didn't take into account how much beefier the QA1 rod ends were, and that makes a difference in total bolt-to-bolt length and adjustment. Just something to keep in mind. I might order an extra pair of 6" rods just in case I run into issues on the install. FYI the QA1 HMS do not have the ridge that you have on yours. Really impressed with the quality and precision of all the QA1 parts. The 1/2" bolts from BoltDepot were a perfect fit. Everything is perfect in the rod end. Just have to make sure that a) the rod lengths give me the adjustment that I'll need, b) that they will fit without rubbing anything, and c) might have to enlarge the bolt holes slightly on the struts and swaybars to accommodate the 1/2" bolts. All are unknowns at the moment. But at least they look serious. Looking at the photos you posted earlier, there is plenty of thread on the rod end bearing. So you should be able to go down to a 6" rod no problem. Glad to hear you got ur joe's bar in safe and sound. The set up looks ALL business lol! Glad to see the HMS are all sorted. Looks like at this point it's just some fine tuning with bar sizes to see what's best. I'm Stuck overseas at the moment at work. But excited to get home and get back after it. Good luck! In before this thread disappears! Better save all this information locally before this thread disappears, its got all the part numbers and cost better than a vendor for a beefy customizable part! Lol PDF version saved locally just in case - thanks for all the research here BLKROKT. Amazingly detailed as usual. Yeah it looks BEEFY. Really massive actually, especially compared to the OE/KW ones. Probably overkill, but I like overkill. If they fit without rubbing, should give great adjustability. Thanks again for the solid rod and the tip on how HMS are actually supposed to work. The rod boots are awesome little things, and seal up nicely around the HMS too. Should I be filling them with grease before installing? I like the look of the Smart String setup as well. It is too expensive in Canadian now so I am still using jack stands and strings. The nice thing about the Smart Strings, but still not perfect, is the ability to leave them set up on the car while you jack it up to do changes and then set it down and roll it around to settle the suspension and still able to take readings without having to set up the strings all over again. Check your car to be sure there are places to set up the bars in the trunk and engine bay that will be easy to set up and secure while you move the car around. AP Rod Ends Shortened to fit. I had to mod my AP end links or buy shorter rods. I decided to shorten the rods I had. Because the rods where not drilled all the way through or threaded deep enough I had to shorten the threaded section of the rod ends as well. I am hoping they will stand up in use but consider them marginal with just 1/2 -5/8" threaded into the rods. The AP end links come with 5/8" 18 threaded rod ends. 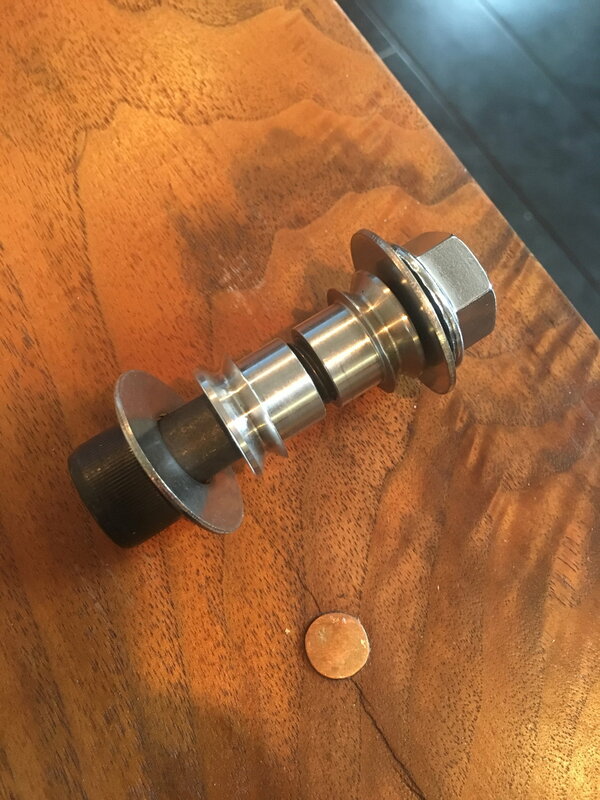 Slightly smaller than the 3/4" rod ends used by BLKROKT. The rods are 8.75" long and after a quick measure to install I figured I needed to shorten them 1.125". The rods now measure 7.625". I also had to cut .625" off the threaded portion of each rod end to compensate for the reduced thread depth in the rods. To install rod ends you need to have the suspension at normal ride height. That means driving the car onto a drive on hoist or driving onto ramps to keep the suspension as close to normal ride height as possible. I bought some Race Ramps that are 3" high to do this and room is marginal under the car at best, but still doable. 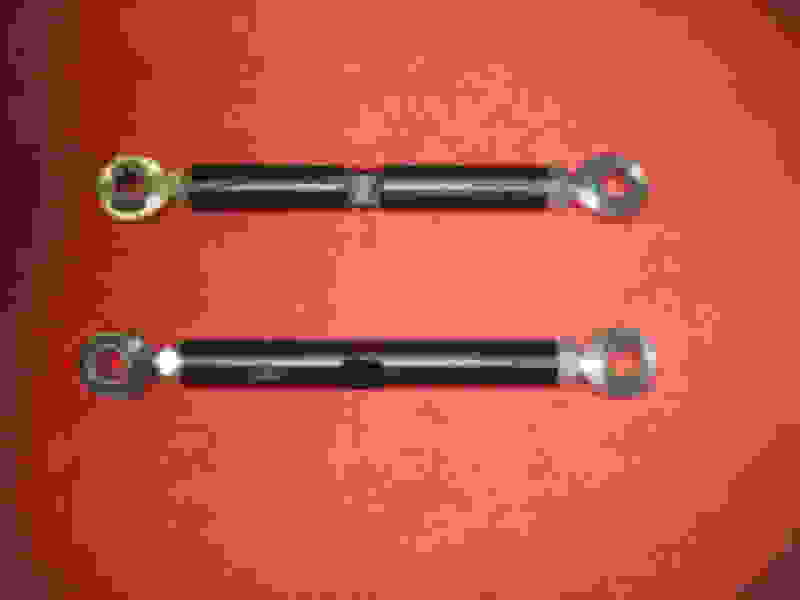 Undo both end links at the sway bar or leave them undone and only fastened at the strut to begin with. 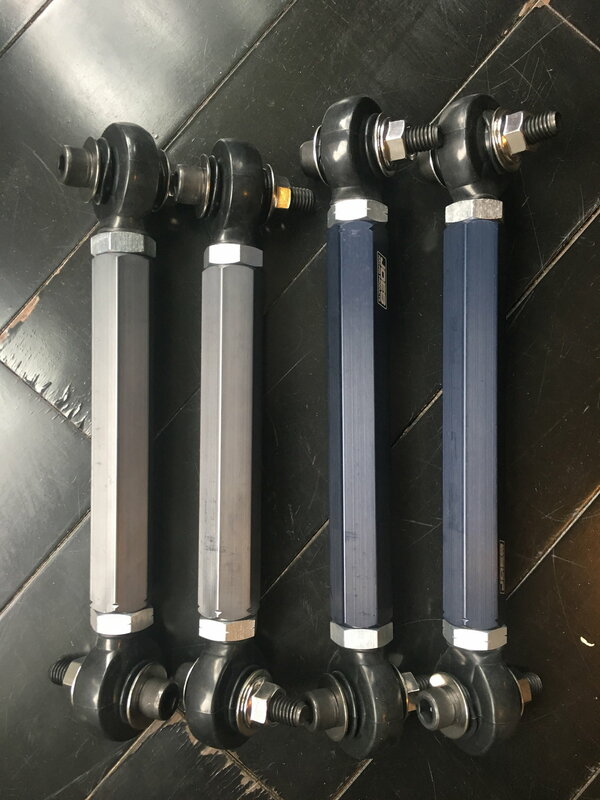 The sway bar is bonded to the rubber bushings so it will just stay in its neutral position and you don't want it compressing the rubber in the mounts at this stage. Adjust the end links so they just mount into the sway bar with no deflection on either side of the car and tighten the bolts securely. The installed length of the end links on my car came out to 10.75" centre to centre. A couple of pics of the end links before and after shortening them. 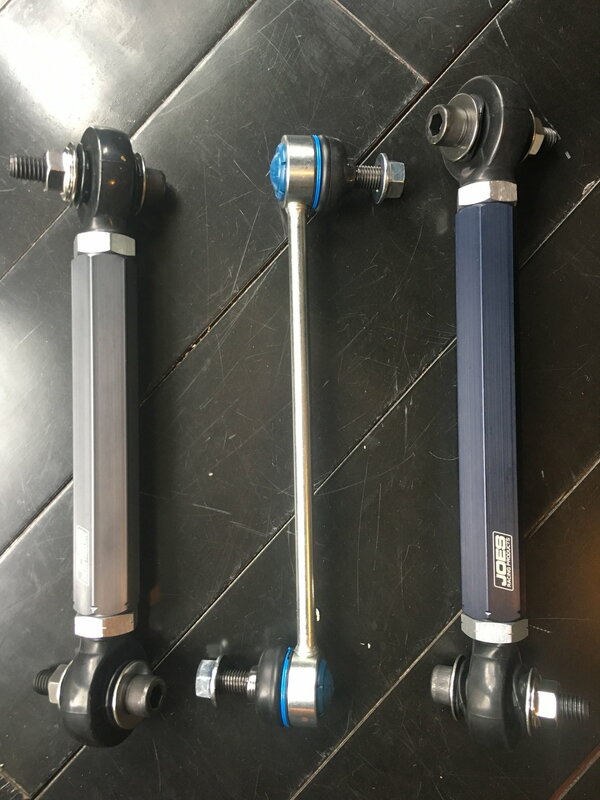 AP Rod Ends stock length. AP Rod Ends shortened 1.125"
I've actually wondered myself about the boots. I was thinking maybe a little CV axle grease injection wouldn't hurt I'll do some digging around and see what's what. The Boots are definitely one of the key highlights of this design! Additionally Was thinking about Using a set Nord lock washers to help flange this beast together. these lock washers are used quite a bit in my line of work. Link below..(check out the junker video)simple but very effective & apparently the best...I'm gonna shoot an e-mail out to one of our vendors and ask for a hand out to see if I can get my hands on about 20 of these things. I'll shoot a set out ur way if you interested..